The valuable contributions of content, support, editing and encouragement from my friends and colleagues Chris Pinder and John Holst are hereby acknowledged. We encourage careful review of our observations and conclusions and encourage more enlightened observers to advise us of any errors or omissions. Wheel covers and hub caps are important components of every car for functional, aesthetic and commercial reasons. Functionally, they are used to protect the lug nuts and studs, spindle ends and axle ends from corrosive and abrasive environmental elements while being designed to stay on the wheel through thick and thin, be easily removed and replaced by the owner when necessary to change a tire and retain their beauty for the life of the car. Aesthetically, they must enhance and be a part of the overall design of the car and serve as a visual identification of the year, make and model of the car. In this sense, the wheel covers become like a proud badge or coat of arms for the car. Commercially, the wheel covers must appeal to the eye of the potential buyer, encourage and help seal the sale and not add more than their fair share to the overall cost of production. And, finally, the wheel covers must not be so attractive, well-designed and easily removed so as to appeal to the hubcap thieves who are likely to be with us forever. 1964 Chryslers come with a wide variety of wheels, tires and wheel covers and some of the wheel covers come with splashes of the same array of colors that are offered for the exterior bodies (NY's, only). This missive is designed to document the proper wheel, wheel cover and hubcap for each model and color of 1964 Chrysler, not including Imperials. Imperial wheel covers are of an entirely different design and are beyond the scope of this missive. 1964 Imperial wheels were 15"x6" designed to fit over five 9/16" studs on a 5 1/2" bolt circle-wholly different and not interchangeable with those on other 1964 Chryslers. The standard wheels for 1964 Chryslers are 14" Drop Center Safety Wheels in 5.5", 6" and 6.5" widths and painted black. All wheels fit on hubs with five 1/2" studs on 4 1/2" bolt circles. The 1964 Chrysler Service Manual indicates the bolt circle for the New Yorker Salon is 4 1/4" in diameter but this is a typographical error. The Service Manual also indicates the high-performance 300K was to be equipped with 15" x 6" wheels but, sadly, the writer is unaware of this being commonly done. It appears this entry may have been an overlooked and unnoticed carry-over from the very similar page in the 1963 Service manual. 15" x 6" wheels were offered on the 1964 Newport "Enforcer" police cars, had previously been furnished as standard equipment on 1963 Chrysler 300-J's and were most likely available on special order. The 1963 Parts Catalog indicates the hubcaps on these wheels were kept in place with spring clips on the wheels. Wheel covers for any 15" wheels ordered and installed in 1964 would have been equipped with 1963 300J wheel covers. All 1964 wheels featured small bumps on either side of the valve stem hole to engage protrusions from the wheel cover that prevent rotation due to the continued (and, often, high-speed) flexure of wheels and wheel covers during operation. Newport Enforcer (Police Car) models, Newports, New Yorker's and/or by special order. While it is not clear what the "spacer" item is in the Medallion Package, it it is likely a round gasket made of stiff foam rubber, mounted at the back of the wheel cover and placed in a little trough around the outside of the bases of the eight stainless steel locking tabs. Four plastic ears protrude from the medallion and these ears fit against the round rubber gasket to allow some crush as the locking tabs are bent down against the round rim around the back of the medallion. The gasket also provides some protection against foreign material entry from the front of the wheel cover. The Parts Catalog also lists "Medallion Packages" for the wheel covers. These are obviously little packages of materials necessary to repair a damaged medallion or replace it with a different one. Newport and New Yorker medallion packages contain the medallion, cover and spacer. The covers are flexible plastic cups in black on Newports and pale green on New Yorker covers. They fit between the back of the medallion and the stainless steel locking tabs and are apparently installed to protect the painted backs of the medallions from any moisture or dirt that might be present behind the wheel cover. The caps have eight tiny holes to allow breathing and centrifugal rejection of any condensate. Why the medallions on the 300's do not have this protective back is another one of the mysteries of life at Chrysler. I suspect oversight. All medallions are carefully and artfully painted in the appropriate colors and, perhaps, flash-chromed from the back and then given a protective coat of flat gray/silver. Another mystery is the alignment of the medallions in the wheel covers with respect to the valve-stem hole. 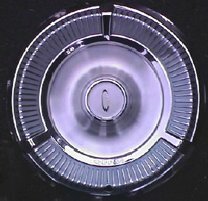 The writer and others have viewed enough 1964 Chrysler wheel covers to come to the conclusion that the medallions were originally aligned with the valve-stem hole approximately directly below the medallion when the medallion is in the "readable" horizontal position. This seems to make sense as the best possible position for the medallion as there are three larger radial "dividers" on the wheel cover with one approximately 180 degrees away from the valve-stem hole and the other two "dividers" positioned at 120-degree intervals from the first and "bracketing " the medallion. There are 28 polished spoke=like protrusions between each of the three dividers and two "spokes" are "lost" at each divider. This places the "spokes" at nice four-degree intervals. Interestingly enough, the valve-stem hole is not placed exactly half-way between the "bottom" two "dividers". 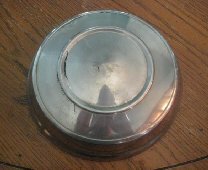 Photographs of the various 1964 Chrysler hubcaps and wheel covers are attached. It should be noted that 15" wheels were certainly an available option on 1964 Chrysler Newport "Enforcer" models and the parts catalog indicates they may have been available on any Newport or New Yorker. Most likely, they could have been ordered on any 1964 Chrysler even though they did not appear in the basic Order Code List. 15" wheels had previously been provided as standard equipment on 1963 Chrysler 300-J's. It is believed that some 1964 300's were so equipped and fitted with carry-over 300-J wheel covers. 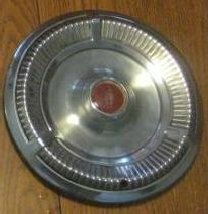 The Parts Catalog indicates the optional 15" wheels on Enforcers and other 1964 Chryslers, Plymouths and Dodges were equipped with hubcaps. There are four specially formed and perforated sections on the back of the wheel covers designed to engage and hold the cover to the wheel. Three of the sections contain six half-moon-shaped indentations/scoops mounted circumferentially. The sharp edges of the scoops are designed, when new, to scrape through the paint on the wheel and engage the steel surface of the wheel. The fourth section contains four circumferential engagement scoops and two axial scoops designed to engage the two anti-rotation bumps on the inner surface of the wheel and on either side of the valve-stem hole in the wheel. 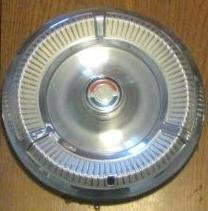 Feedback from owner operators of 1964 Chryslers suggest the anti-rotation and engagement scoops wear and deform enough with time to lead to whirling flying saucers, accompanied by noticeable squawking from the relative motion between wheel cover and wheel as the wheel rotates and deflects at approximately 700 RPM at 60 MPH. Solutions to these terrestrial phenomena include reforming all the little scoops and sharpening their edges-or, placing little dabs of silicone sealant here and there around the inside surfaces of the wheels where the scoops meet the rims. I told you. Take heart, the wheel and cover story was similar but even more complex in 1963.